I will have a friend visiting this week, so I'm hoping to take more pics around Hong Kong. I love, love, love street photography, but I haven't done much of that lately. We might skip the more usual tourist stops (she's visited before) and hit some of the lesser-known ones this time. 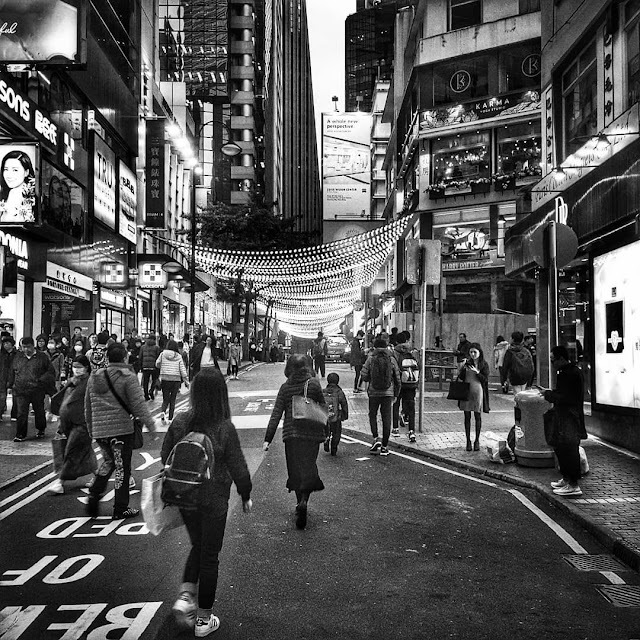 This scene below was taken in Causeway Bay, in the early evening on a weekday. People are getting off work and heading home or off to meet up with friends for dinner. Great monochrome image.I need to experiment with that. Quite an editorial shot. Love it! My brother lived in Hong Kong for years as an international pilot. Unfortunately, I was never able to visit this amazing city when he live there. I love to show visitors lesser known places. I think they enjoy them more. Have a good time! Your city for street photography is much more interesting than mine! Enjoy your friends visit and have a fabulous week. I don't do 'early' but your photo is fantastic! Love and now I am jealous I can't go with my husband in May! The black and white works so well with this photo! I hope you are enjoying your visit with your friend! Great photo, and love the high energy it conveys! I could totally get into street photography if I lived in the city.